Brendan Clarke; Ger O’Brien, Kenny Browne, Conor Kenna (capt), Ian Bermingham; Conan Byrne (Jake Kelly 79), Greg Bolger, Killian Brennan, John Russell, Christopher Forrester; Christy Fagan. Barry Murphy; Pat Sullivan (capt) (Shane Robinson 51), Derek Foran, Jason McGuinness, Danny Ledwith; Sean O’Connor, James Chambers (Ciaran Kilduff 75), Stephen Rice, Ronan Finn, Billy Dennehy (Gary McCabe 58); Karl Sheppard. St Patrick's Athletic were held to a scoreless draw by Shamrock Rovers in tonight's Airtricity League Premier Division clash at Richmond Park. Liam Buckley's side dominated throughout but failed to make the most of their possession and missed several decent chances to take all three points. But it was the visitors who could have snatched all three points when a late Ciaran Kilduff effort was spurned after Danny Ledwith saw his long-range shot parried by Saints keeper Brendan Clarke. Rovers came into the game brimming with confidence following their tremendous Setanta Sports Cup victory on Saturday, yet it was the home side who started brightly. In fact, the Hoops looked a little lethargic in the opening exchanges and Saints created two early chances thanks to some clever running in behind from lone striker Christy Fagan. However, Barry Murphy was barely troubled by either effort. Despite the early pressure, Rovers were almost gifted an early lead with 15 minutes on the clock after a sloppy back-pass from Ger O'Brien had keeper Clarke scampering out of his box to clear just ahead of the predatory Karl Sheppard. What followed was a decent spell of Rovers pressure, without creating anything of note and eventually the home side began to take control with the lively Chris Forrester finding his touch drifting at will across the midfield. And it was former Rovers midfielder Killian Brennan who almost initiated the opening goal after, surprisingly, getting the better of Stephen Rice in a midfield challenge. Fagan linked up well with Bermingham down the left wing and the ball reached John Russell on the edge of the box. The former Sligo Rovers midfielder rolled it square to Fagan who made a yard of space but crashed his shot just over the bar from 12 yards out. Rovers best chance of the half came from a set-piece ten minutes before the break as Jason McGuinness rose highest at the back post to power a header downwards, but it bounced the wrong side of the post and into the side netting. There were few chances but plenty of fight for the remaining ten minutes of the half as several late challenges threatened to turn the contest nasty but the half-time whistle arrived, the sides scoreless at the break. 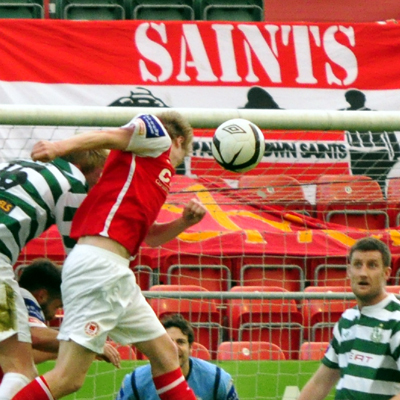 Saints again took the game to Rovers in the second half as the Hoops lost captain Pat Sullivan to injury with Rice slotting in at right back and Shane Robinson coming into the middle of the park. And the deadlock was almost broken 13 minutes into the second period as the Inchicore side took a more direct route into the right corner. Conan Byrne cut a fantastic ball across the six-yard box at pace but John Russell could not direct the header on target and the Hoops survived. Pat's maintained the pressure and had two chances within five minutes to break the deadlock but both Forrester and Brennan, from a free, failed to test 'keeper Murphy. The rain began to fall to aid the pace of the game on a less-than perfect surface as Rovers emptied the bench looking to target-man Ciaran Kilduff to lead the line alongside Sheppard as the Hoops changed into a 4-4-2 formation. And the change almost immediately bore fruit as Rovers put pressure on the home midfield allowing Danny Ledwith to run onto the ball and smash a fine effort goalbound. Saints custodian Clarke was called into action and responded to the challenge to make a great save to his left. The ball fell invitingly for the inrushing Kilduff but the towering centre-forward was unable to divert the ball into the empty net. Rovers played out the last ten minutes with ten men as Ledwith picked up an injury, with manager Trevor Croly having already used up his three substitutes. Saints piled on the pressure for the remainder of the game making the most of the numerical advantage and almost grabbed a late winner after some great work down the left, before the ball was rolled across the danger zone just needing a touch to finish off the contest. But it was makeshift left back Sean O'Connor who reacted quickest, reading the run of the ball across the six-yard box and cleared the danger as Rovers held on for a well-earned away point. Saints will be disappointed not to have taken all three points after dominating throughout, but will rue the missed opportunities and take scant consolation that they moved into second place in the table now three points behind leaders Sligo.